We Have A Huge Selection Of Available Necks !! Many are in stock, some need to be custom built !!! When buying a Moses neck somewhere else, please be aware that the externally mounted truss rod adjusting wheel that Ed Roman provides will not fit correctly on other Moses necks. The Moses cavity is too deep. Moses makes a good quality neck. In fact they make our necks also. The prices are about the same and our neck will allow you to adjust your truss rod without removing your neck. So unless you want to remove your neck to adjust the truss rod, we suggest you buy the neck from us. Plus our price is usually lower than direct !!!! The new Ed Roman all graphite necks are built the way Status, Rainsong & Modulus Necks are. These are not composite. These are actually true graphite necks. Yes they do cost more but hey, it's only money !!!!!!! We guarantee to have more choices in models and we have them in stock !!!! Lots of BC Rich oddball configurations available, please call for special quotes. If you send us your body we will handfit one for you at no charge. January 13th 1993, BC Rich closed down the second time, Ed Roman purchased the entire inventory of BC Rich Guitars, body cores, body blanks, parts, cases, necks & assorted jigs & tooling. BC Rich, was also manufacturing necks & bodies for Dean at that time. Ed also got a lot of those parts. Many of these necks already had decals on them, many of them didn't. The ones with the decals are of course more money, We Americans don't mind paying for a label (Stupid But True) Look what Gibson & PRS charge for their name. The headstock on the Gibson replacement necks are different than original for obvious reasons, Gibson is horribly litigious and they want to sell you another guitar. They don't want you to be able to fix your broken one. We have sufficiently changed the headstock so that it will pose no legal problems. In fact we have made it slightly larger in one place. Theoretically a customer could file the little point that we have added to the center of the headstock and no one could tell the difference. Personally I like the headstock better on the neck we supply. Our necks have an extra support where the Gibson necks all break. If you like the feel of an original Charvel Gold Logo San Dimas Guitar; You will love our San Dimeon. Original Kramer American Necks We have a limited supply of different ones available like the hockey stick above. Rosewood, Ebony & Maple fretboards. 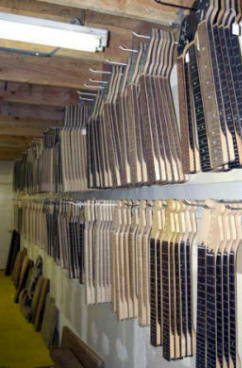 We also have excellent quality, quartersawn, USA made aftermarket replacement necks, in any fret size and/or any radius. We are always looking to buy Kramer necks, even if they are broken. + PRS Neck PRS Engraved On 12th Fret Abalone Birds, We generally have 5 or 6 used PRS Necks In Stock. + We also offer High Quality Aftermarket Necks. + We Have USA Made Replacement Necks That Far Surpass The Original PRS Necks. + Differences Include, Binding, Ebony, Custom Inlays & Much More. + Original PRS Necks With Logo. Exact PRS Headstock Cut Add $100.00, Original Logos Available. Make sure you read below before you dial our number !!!! Original Ibanez Necks New & Used Also Replacement USA Made Ibanez Necks. A perfect fit means better stability and better tone. DO NOT EXPECT US TO TAKE & GIVE YOU MEASUREMENTS ON THE PHONE !!!!! There are many different Ibanez necks, We cannot & WILL NOT discuss them with you unless you send us your body that you are trying to fit up to. Ed Roman Aftermarket Quartersawn USA Made Upgrade Replacement Neck (Fits Most Ibanez) We Will Always Allow A Trade In On Original Necks. Choose - Maple Neck, Rosewood Neck, Macassar Ebony, Koa, "Fancy Grades Available"
No Luthier Joint Behind Third Fret !!!!!!!!!! Ibanez Does Not Sell Necks. 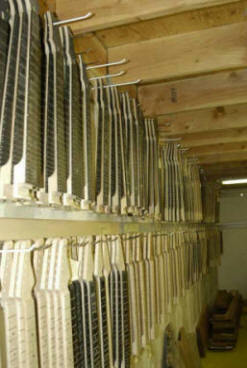 We Have Necks In Stock For Almost Any Guitar You Can Think Of !!!!! Customers are required to be very clear about what they want and expect. We will not be responsible for fit if customer does not supply the body before we start the job.